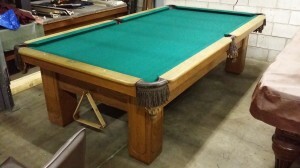 Are you looking for pool table service and store offering new and used billiards in the Chicago metropolitan area? We are the expert full time provider offering wide selection of used pool tables and services to meet your needs. Maintaining high quality and affordable prices is our first priority. 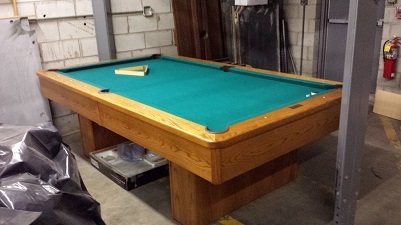 Whatever concern you are having with your pool table equipment, our experienced staff can get it fixed. Suitable for residential and commercial pool table services. Alpha Billiards is specialized in commercial and residential billiard services. If your billiard is not functioning properly, then there is no enjoyment in playing the game. Our experts are capable of identifying wide variety of problems with your billiard table that make it underperform. If you contact us with your problem, we will send our experts to verify the condition of your billiard and suggest the best suitable service. Alpha Billiard is licensed and insured with over 25 years of experience in repair and sale of new and used billiards. Have you decided to relocate from your present address? Time to book professional pool table movers. Alpha billiards moved hundreds of tables over the years. We will take care of all the related aspects of the move. Your billiard will reach its new location in a save and stress free manner. Top class new and used pool tables. If you need a new or used billiard, then give Alpha Billiards a call. You can order a correct size of the table by checking room dimensions needed for each size of the table. You do so by clicking “Room Needed” section, located on top of our site. (58in cue is the standard size for the game) Once you decide on the size call 708-415-1403 to find out more about our store inventory selection.